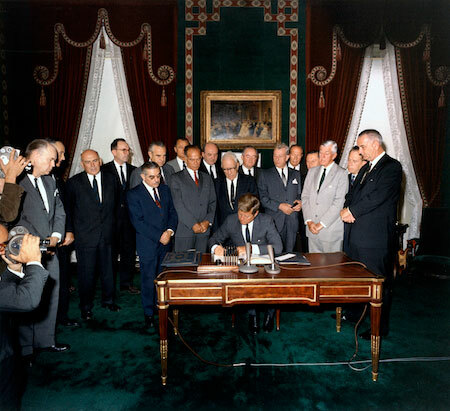 This treaty did not have much practical effect on the development and proliferation of nuclear weapons, but it established an important precedent for future arms control. Both superpowers entered the 1960s determined to build or maintain nuclear superiority. The Soviet Union had led the way in the development of intercontinental ballistic missiles after its launch of the first man-made satellite,Sputnik, in 1957. In just a few years, it had developed an arsenal of long and medium range missiles that had raised alarm in Washington. President Kennedy had even campaigned for office on a claim that President Dwight Eisenhower had allowed the Soviet Union to far out-produce the United States in nuclear technology, creating a “missile gap.” However, soon after he took office, the Kennedy Administration determined that the balance of nuclear power remained in favor of the United States.